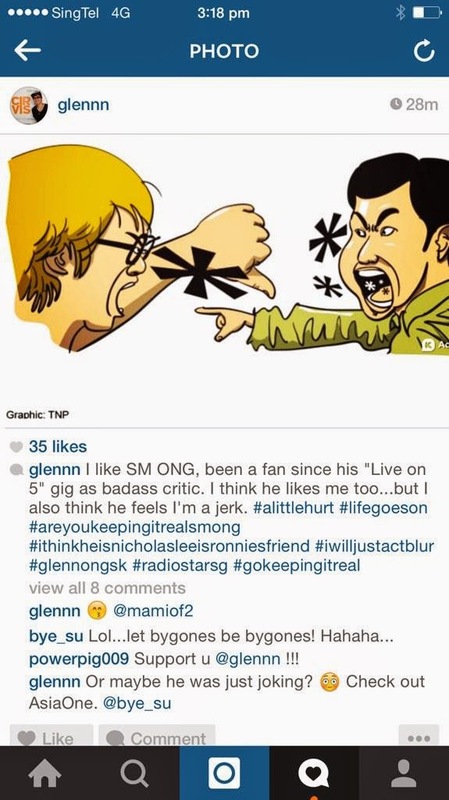 S M Ong: Another 'online spat': Glenn Ong versus... me? I guess this has been a long time coming. Do I finally get to be in an 'online spat' with a local celebrity? As Dolly from Under One Roof used to say, so exciting! I'm a lover not a fighter. @GlennEgoman Not Richie. It's Michael Jackson & Paul McCartney. Understandable mistake. Glenn probably confused Say Say Say with Richie's Say You Say Me. @sm0ng Dammit! You're right! My bad. (I hate that song by the way! )That still doesn't make things right between us Ongs! @sm0ng We are more similar than you think Mr Ong. Let's leave it as that. If I ever get back on Radio, you come on the show! It'll be fun. And just like that, Glenn's "online spat" with me was over. Not exactly the thriller one had hoped.